At Thursday’s matinee performance, I sat behind what had to be the most ardent fans of Wicked in northeastern Oklahoma. Not only did they know every word of every song of this musical (which opened its 16-performance run at the Tulsa PAC on Wednesday), this couple also quoted most of the show’s choicest lines of dialogue, usually in perfect sync with the performers on the Chapman Music Hall stage. And they spent most of the intermission telling all who would listen how this particular performance compared to the one they had seen last summer, when “Wicked” spent a month at the PAC. This particular touring production of the show benefits from a pair of excellent performances by its leading ladies, Vicki Noon as Elphaba and Natalie Daradich as Galinda. Daradich’s Galinda has all the self-absorbed perkiness one expects, but she never slips into the cartoonish antics that we’ve seen other actresses use. Her Galinda is a little more complex, a little more human. The same is true of Noon, who plays Elphaba as someone who truly feels the pain of being an outcast, rather than someone who relishes the anger her status engenders. Even the moment when she lets out a Margaret Hamilton-like cackle – which got one of the biggest ovations during Thursday’s matinee – had a kind of poignant edge to it. Noon’s and Daradich’s singing voices are so finely matched that in their duets it often sounded as if some passages were sung by a single voice, rather than two. That, and the fact that the two women are the same height, emphasized the concept that these two very different people are two sides of the same coin. The weak links in the cast – or, to draw from the clockwork theme of “Wicked’s” set design, the two cogs whose gears don’t quite mesh – are Chris Peluso as Fiyero and Don Amendolia as the Wizard. 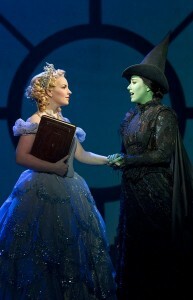 Wicked continues with performances through Nov. 28 at the Tulsa Tulsa Performing Arts Center. Tickets are on Sale. Wicked Tulsa OK Tickets Online. This entry was posted on Saturday, November 20th, 2010 at 5:57 pm	and is filed under Uncategorized. You can follow any responses to this entry through the RSS 2.0 feed. You can leave a response, or trackback from your own site.